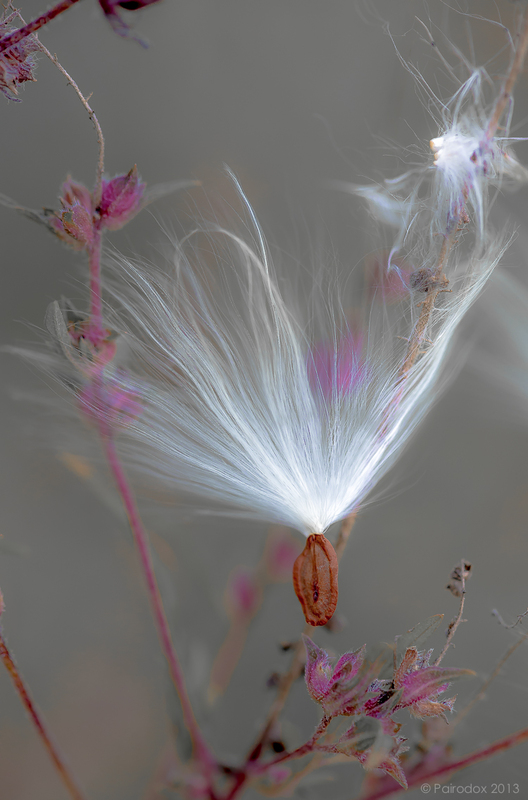 I captured the image below on a windy and dry day when several Milkweed seed pods had opened to release their contents. Although I am not enamored with the vernacular concept of the Bucket List, the delicate seed of the Milkweed is a photographic subject that I have had in the recesses of my mind for some time. I must have looked quite the fool to Joanna as I scurried about the pasture inspecting each little bit of fluff as it landed. Several carried what appeared to be aborted seeds. These would not do. Many had landed chaotically and rendered their silky threads in disarray. Some landed on the ground while others floated aloft and into the adjacent wood. The flight trajectory and soft landing of only a very few rendered them appropriate subjects. In our very vertebrate way of thinking it can be easy to assume that all reproductive processes take place somewhere inside. Whether it be spermatogenesis, oogenesis, fertilization, or embryonic development and gestation, events such as these are entirely hidden from view. Vertebrates are rather curious in this regard but remember that they comprise just 3% of the animal kingdom. This proportion is vanishingly small if one includes a variety of other organisms in the calculation. So, vertebrate reproductive processes take place inside. In many other organisms however, including a vast number of both plants, invertebrate animals, and fungi, much of reproduction takes place exclusively outside. In the case of a great number of marine animals, especially those that are either sessile or sedentary, the act of spawning eggs and sperm into the water column is simply a means of achieving fertilization. The liberation of plant pollens into the air or onto an obliging pollinator does the same thing. So the next time you find yourself sneezing because of a nose-full of pollen, enjoying a shower of whirling Maple seeds, or viewing a flotilla of tadpoles cruising the shallows realize that life begets life and it does so in a myriad of fascinating and very different ways. In case you were wondering, the title of this post, Every living thing comes from a living thing (an egg in particular), is one of many phrases which grew out a movement which began with the work of Louis Pasteur who, of course, is known to have disproved the idea of spontaneous generation. The words are those of Francesco Redi who showed that maggots did not arise de novo from decaying meat but rather developed from eggs deposited therein. Click on the image for a view with higher resolution. POSTSCRIPT: Milkweed belongs to a group of plants which are well known for producing chemicals called cardiac glycosides, a medically important group of drugs which have both therapeutic and toxic effects on the heart. Perhaps you think it strange that a plant should generate such a compound? Did you know that Monarch caterpillars and adult butterflies feed on the milky latex produced by Milkweed and that this material is high in a cardiac glycoside called cardenolide? Cardenolide is noxious and highly toxic to most anything that ventures to ingest it and what we see as beautiful coloration in the Monarch is, in an evolutionary sense, a warning to would-be predators to stay away. What’s even more fascinating is that certain other lepidopterans, such as the Viceroy for example, mimic the Monarch. Ecologists continue to debate whether the Viceroy might be palatable and is avoided by predators because of its resemblance to its noxious partner (this is Batesian Mimicry) or whether the Viceroy is every bit as noxious as its partner and is avoided because of its own display of warning coloration (and this is an example of Müllerian Mimicry).